Panopto's cloud-based online video editor makes it easy to accomplish the most common video editing tasks, right from your browser. Most video editing tools take a lifetime to learn. Panopto keeps things simple, making it easy for anyone to clean up a completed recording before it’s shared. Best of all, editing in Panopto is non-destructive, so no matter what edits you make, you’ll always have your original recording you can revert back to. Trim unwanted parts of your video, or split existing videos into smaller clips. Switch between different video inputs in multi-camera recordings. Combine existing recordings, or upload and splice in new videos. Add and sync additional slides and video feeds. Make your existing recordings even more valuable. Panopto’s video editor makes it simple to upload and sync additional content as a secondary feed — so even if your original recording didn’t capture your slides or couldn’t include a supporting video, with Panopto, you can quickly add those resources in for future viewers to see and benefit from. Embed quizzes, polls, and surveys. Panopto natively includes in-video quizzing, with no third-party software required. 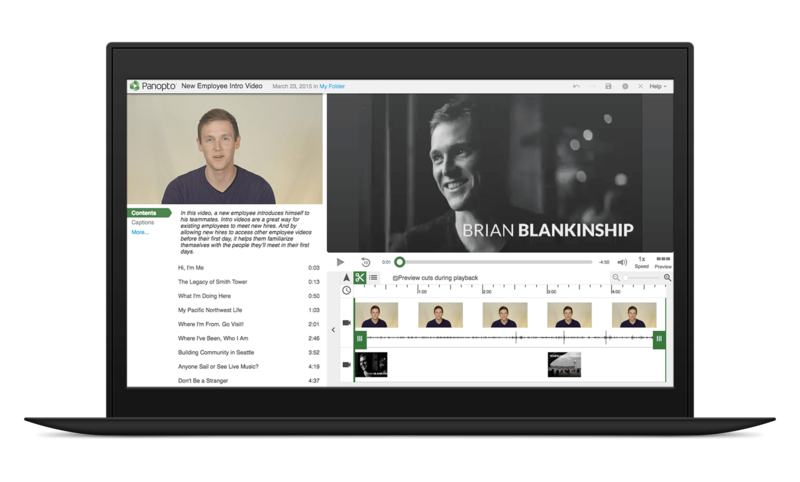 Use Panopto’s video editor to create and embed interactive quizzes, surveys, and polls at any point in your videos. Viewers can respond directly in the Panopto video player, and their answers are tracked and shared in the analytics for the recording. Embed YouTube videos in your own recordings. Videos shared publicly on YouTube can be valuable supplements to your own instructional content. Panopto makes it easy to embed videos and clips from YouTube in your own recordings — just open the Panopto video editor, select the point in your video where you’d like to insert the YouTube file and paste in the public link. You can also control autoplay and the visibility of YouTube controls in your final video presentation. Embed any web page in your video. Want to include a web-based poll or survey directly in a video? Add a link to your course syllabus or a Google Doc? Have viewers read a supporting article online? Or share any other resource that can be made available as a web page? With Panopto, you can easily embed web pages into your videos using the Panopto Editor. Just select the moment during playback you want the web page to appear and paste in the URL. Panopto will automatically pause the video while viewers interact with the web page, and once they’ve finished, resume playback right where they left off. Panopto’s Smart Search video search engine automatically indexes every word spoken and shown in every video uploaded to you Panopto library. You can choose to make this machine-generated transcript available for use as closed captioning for improved accessibility. Because no machine-generated captions are 100% perfect, Panopto makes it easy for you to make edits. Just open your recording in the Panopto video editor, select your captions, and type in any changes the same way you’d make them in a document or email. Read more about editing video. Panopto makes it easy for your organization to record, share, and search video. But what happens if your video doesn’t turn out perfect?